Filed to: notorious b.i.g.Filed to: notorious b.i.g. 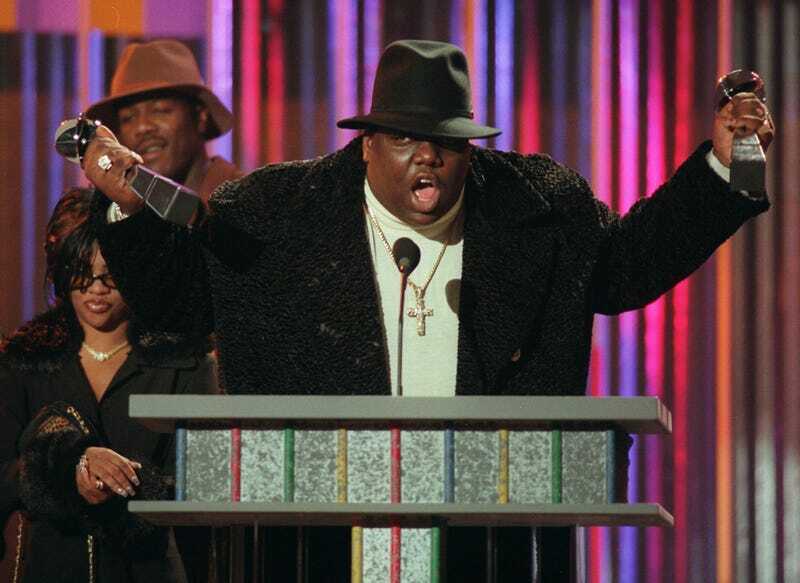 Every year, March 9 rolls around, and we celebrate through music and reflection the life of Christopher Wallace, aka the Notorious B.I.G., aka Biggie Smalls, aka Biggie, aka the only Christopher we acknowledge, who was gunned down in Los Angeles on March 9, 1997. The Brooklyn, N.Y., MC from Bed-Stuy is one of the all-time greats, and despite his small catalog—two proper studio releases, Ready to Die (1994) and Life After Death (1997)—he is highly revered in the hip-hop community. And he is STILL the MC I’m most impressed by. Jay-Z is my favorite rapper of all time. Some of that is due to my undying loyalty to his debut album, Reasonable Doubt. The rest is due to how many songs and albums of his I enjoy, how good a rapper he was at his height (and how long that height was) and how much better he is at rapping than so many others, even now. Greats gon’ great. That STILL gives me the warm-and-fuzzies. And this is on a track where Jay said, “Like short sleeves, I bear arms ... ” Those guys. Listening to the back-to-back bangers “Unbelievable” and “Suicidal Thoughts” (among the rest of the records on the album), I can’t help being impressed by how lyrically dextrous he was on “Unbelievable,” where he famously weaved “recent shenanigans” into the first verse. That song should be studied in classes about creative writing for how perfect the wordplay is. And “I Got a Story to Tell”? Bruh. Easily one of the top five greatest stories on hip-hop wax ever. And truthfully, I could go song for song on both of his albums and talk about how his lyrics and craft are unparalleled, but to know Biggie is to already know his talent. Even Born Again, his posthumous release, featured “Dead Wrong,” which, good gracious. One day, I promise you, I listened to it 20 times in a row. I won’t say that there aren’t other MCs who are as capable as Biggie. We’ve had a few; Jay-Z comes to mind, and who can forget other cats like André 3000 and even Prodigy from Mobb Deep, who I don’t think gets nearly the credit he deserves? But if you take the best assets of the best rappers to ever do it, Biggie had at least an above-average mastery of each of them. He had personality, wit, lyrics, flow, swag, humor, edge and every other characteristic you could want in a rapper. Every year on March 9, we celebrate him; it’s been 21 years since he passed away. And every year, when I listen to my Biggie albums, I still find myself smiling and appreciating his gifts and what he did give us while he was here. He impressed me with his skills, something that only a few rappers have ever done. Any rapper would be smart to attempt to emulate him. He had it all. We’ll always love Big Poppa.